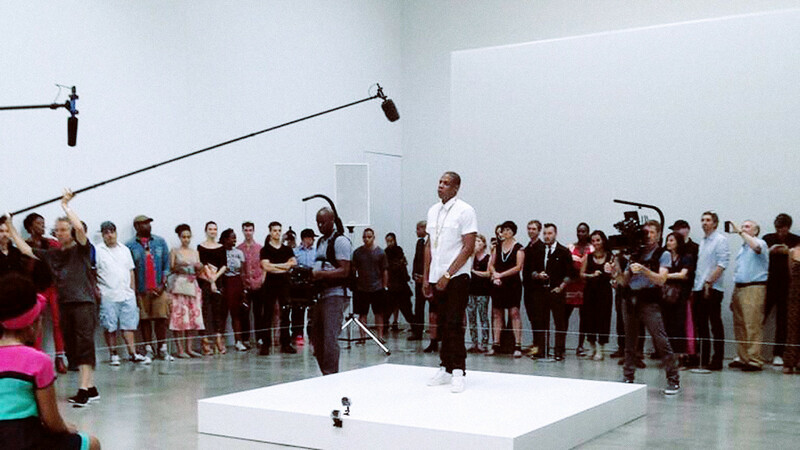 Jay Z performs “Picasso Baby” to audiences, one-on-one, for an entire day at Milk Studios NYC. Bringing hip-hop to a live canvas. There’s been a lot of talk the past two weeks or so in the arts world on the question of, “Should we let arts organizations die?” It was all sparked by a session at this year’s Americans for the Arts Convention in Nashville, co-hosted by Devon Smith, and her subsequent post on the matter. Devon’s argument during the AFTACON session, which I attended, and her blog, were pretty much spot on for me. The two topics are intrinsically connected. Staying relevant in your community, in your industry, and to your staff, board and audiences is the first step in ensuring your survival. And it seems to me that there are four qualities of organizations that succeed in staying relevant and staying alive. 1) Create leaders by investing in your staff. Organizations that value the growth of their staff as much as they value their programs tend to be the ones everyone gets excited about. We need more executive directors that encourage their staff to not only become better employees for their organization, but more importantly become leaders in their industry. Expanding professional development budgets to a level worthy of industry leaders should be a priority for organizations. Organizations should be able to stand on the shoulders of their employees, they should be recognized by the public and colleagues as brands that understand the importance of their staff. Additionally, putting more of your staff in the world on behalf of your organization can only increase your reach and name recognition. Join your Chamber of Commerce, and actually attend networking events. Go to your state’s advocacy day, and take your whole staff. Increase your professional development so that your staff can actually make a difference in the industry, not just your staff meeting. 2) Embrace emerging leaders by giving them real responsibility. Okay, reality check – stop pretending to involve emerging leaders and young professionals. Give us a seat at the table, let us speak, and listen. I don’t know about you, but I am pretty tired of talking about my generation as if we are aliens to this field. What we don’t need are more strategies for recruiting better leaders. What we need from each of you is action. News flash, your Marketing Assistant wants to be a Marketing Director. Maybe not at your organization, but at some point. So give them the experience and tools they need. Are you worried about the lack of young professionals in your audience? Put one on your board – and not some non-voting, experimental, rotating seat board membership, but an actual seat at the table. (By the way – if you have to recruit young board members to solve young professional problems, and you have young professionals on staff already – see #1 first, and then do both). Additionally, by incorporating the other qualities I’ve mentioned here, you’ll create a more desirable environment to attract better emerging leaders and more young professionals. The millenial generation loves the arts – we really do. But we’re looking for adaptive and relevant art, not establishments. We want something we can take our grandparents to that they’ve never seen, not something that our grandparents always took us to and that we’ve seen every year. And keep in mind that in our generation, we’re looking for social currency – it’s cool nowadays to just simply sometimes be “around art”, and sometimes that’s all we’re looking for…an Instagram-able moment. The point is this: Young people are always going to be a thing. There will also be more young people. They are not going away, and recruiting new customers is always a hard thing to do. As an industry, we need to build organizations for the future, not for the next five minutes. So bring on the young whipper-snappers. 3) Further your mission, don’t just fulfill it. Staying flexible is key in staying alive and relevant. Change is not to be feared by arts organizations. In fact, our industry should be on the fringe of change. Our calling in the arts field should be to our mission and our art, not to our bank. Obviously we shouldn’t be financially inept, but if your organization has been around for 50 years and your audience hasn’t gotten any younger since, or your show selection remains on the same 6 year cycle, then you are running the risk of losing your relevance. There’s an ancient Chinese proverb that I absolutely love which reads “If we do not change our direction, we are likely to end up where we are headed.” Heed that advice. 4) Make your world a better place. Whatever “your world” might be – the entire state of Texas, the entire Southeast, or little old Fountain Inn, SC (where I live) – your organization is tied directly to the community in which it resides and serves. Much like the item above, adapting to your community is a cornerstone of relevant organizations. When I say adapting to your community, I don’t mean simply choosing a season based on a survey. Rather I mean investing real capital, real assets into your community’s fiber. Your community doesn’t always need to be in your building to experience your mission. A ticket isn’t the only way you can interact with your audience. Just like keeping your staff on the forefront of the arts industry is vital, keeping your community there is too. The arts aren’t the only places arts organizations can lend a hand. As I said during the “Relevancy” session at AFTACON, the arts need to be a tool in the toolbox for our community – we need to be able to be part of the solution, no matter the problem, whether it is housing, community planning, crime prevention, or otherwise. Additionally, no matter the size or scope of our community, arts organizations need to cultivate an audience for the future of the entire industry, not just for their own benefit. Developing audiences that have an appreciation for art and the role it plays in their lives is key especially when you consider the mobility of today’s generation and their ability to connect with others all over the world in a mere swipe of their phone. In today’s world, we are no longer singular organizations, we are a truly connected industry and depend on each and every arts organization to help advance the future of our field. So don’t mess it up for the rest of us. 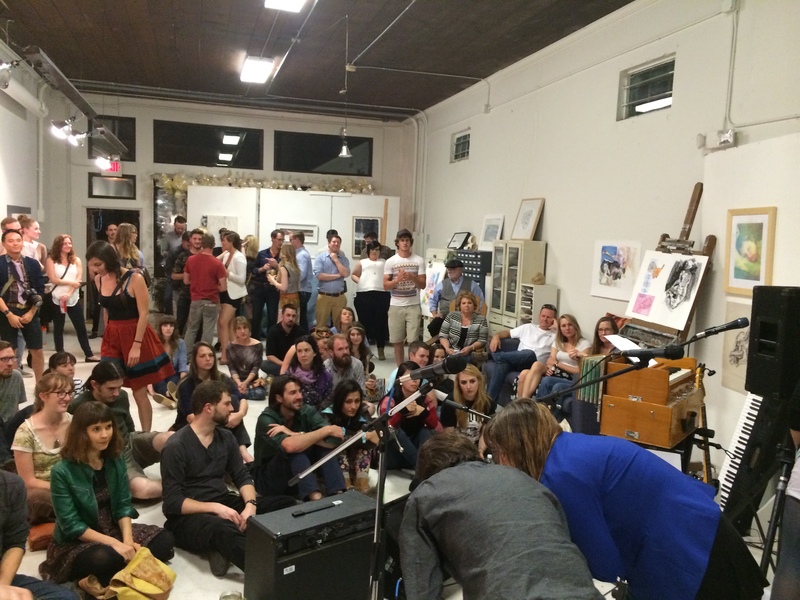 A pop-up show from “Art Wall Music Hall”, a local nonprofit I am involved in that brings emerging musicians and emerging visual artists to the public. And here’s where the rubber meets the road. None of these items are one-time strategies. You can’t wake up on Monday and say you will do all of these by Wednesday. They take time to develop and establish. Which is why I side with Devon on letting arts organizations that do not adapt, die. It is up to the organization to stay relevant throughout its history. It is up to the community (audiences, staff, board, funders, colleagues) to step in with their support (financial or otherwise) to save, or let go of, organizations. If both of these stay in a healthy balance, then the organization and the community both know when attention is needed. It is a two way street and both parties need to be open and realistic about the organization’s relevancy. Organizations don’t have to die, but if they can’t stay relevant, they will.